As a StepMania veteran, I like to think that rhythm games are my thing. Mind you, I'm no Guitar Hero or Rock Band star but I can at least move my fingers to a beat. I also enjoy my roguelikes; Dwarf Fortress, Realm of the Mad God, POWDER - all of which are games so difficult that you are left with a real sense of accomplishment by simply making it through the first or second floor alive. 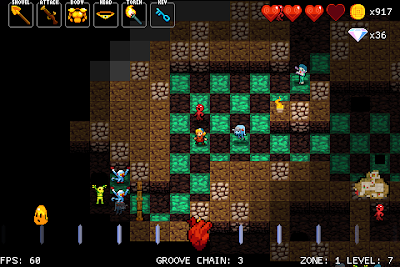 Brace Yourself Games's Crypt of the Necrodancer however, is a whole other ball game. 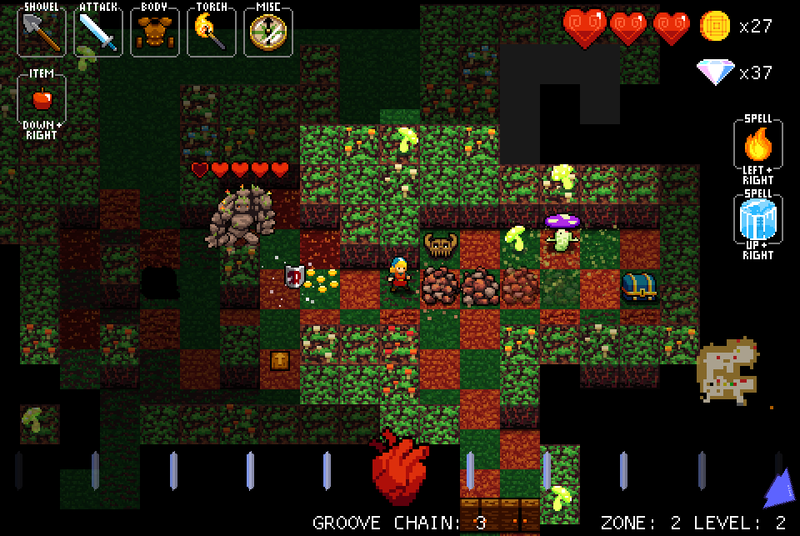 It's a roguelike in foundation... that is, until you try to move. At that point, the game pats you on the head, says "Nice try", and displays a little [MISSED!] on the screen. 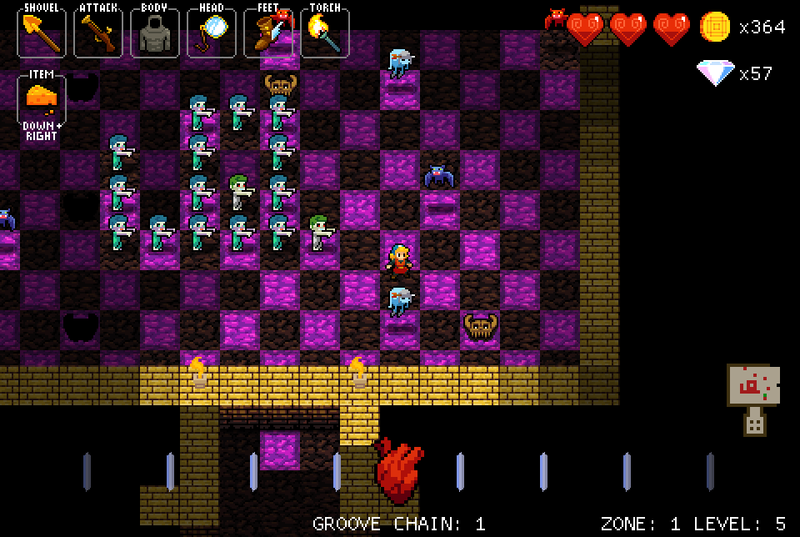 Oh yes, ladies and gentlemen; believe it or not, Crypt of the Necrodancer is a roguelike rhythm game. Your movement through the world is dictated by the beat. Fail to move in the four cardinal directions or attack an adjacent enemy on-time and you'll miss your turn - or worse - take a hit from the various nasties dwelling in the depths of the randomly generated dungeons. 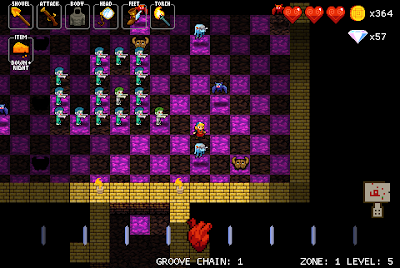 Successfully kill a foe and the floor tiles will start pulsating with disco lights representing that your groove chain is active, during which the number of coins you collect from each kill will build up in the form of a multiplier. However, it only takes one single miss-step for it to crash down to zero again. It's an ingenious system that works really well, keeping the game fast paced and the player on their toes. 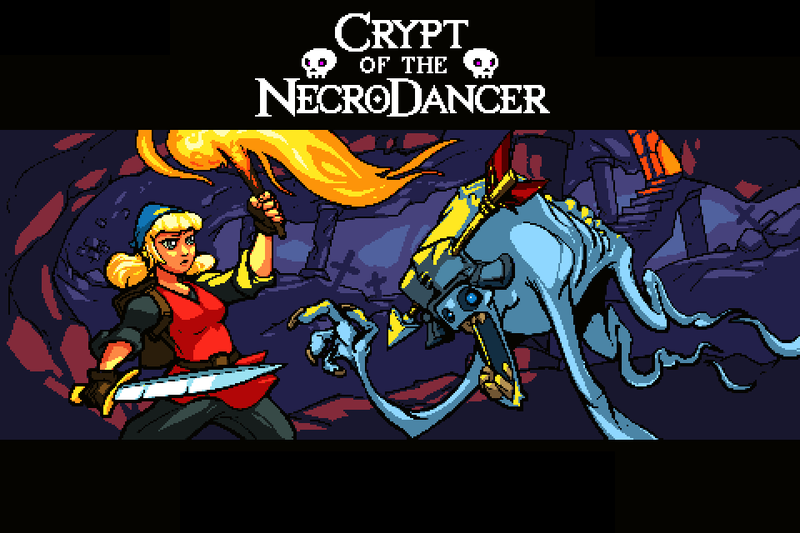 And talking of feet, I can only imagine that Crypt of the Necrodancer must be an absolute riot to play on a big screen using dancemat to control the action, which by all accounts is exactly how it was showcased at PAX this year. Initially armed with a pathetic dagger and a shovel, it may seem that the odds are against you, but as long as you are able to keep to the rhythm it won't be long before you're armed to the teeth thanks to the generous number of chests, diamonds and general loot scattered around the levels. 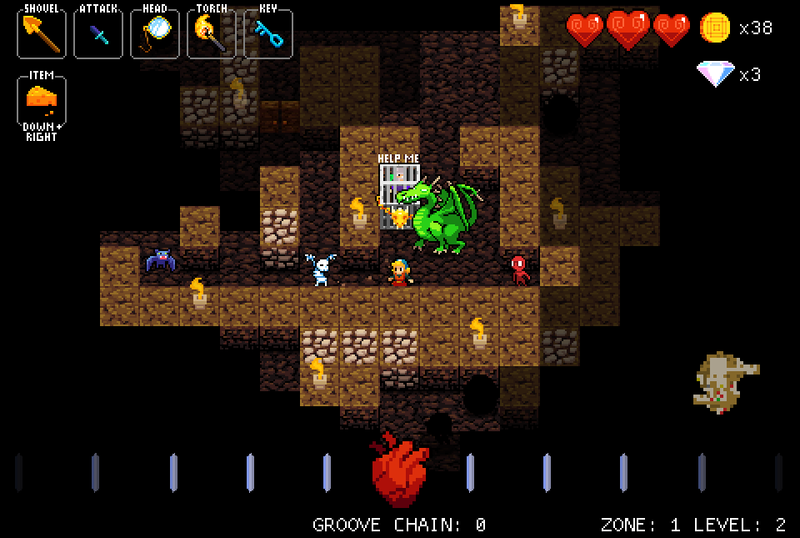 Diamonds are particularly useful, as they can be used to buy permanent player upgrades from npc's rescued from boss monsters during your quest, but you don't have an endless amount of time to explore each floor - when the music ends you instantly plummet down through a trapdoor, and it's on to the next stage. 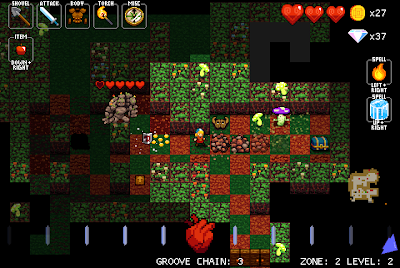 Crypt of the Necrodancer is a rare treasure indeed; a truly innovative game that has taken two seemingly incompatible game genres and created an amazingly fresh and funky mash-up that is simply a ton of fun to play. Despite still being in alpha stage, the presentation is top quality stuff and even the main structure seems to be all there, already featuring a tutorial and a game-menu lobby area for your hero to dance around and access the various unlocked zones. The soundtrack provided by Danny Baranowsky's suits the gameplay perfectly, but you can even add your own tunes to the playlist if you prefer (albeit via a rather long-winded system). This is likely to be streamlined in future builds, but even at this early stage it works really well, as long as the music imported fits within the game's fixed bpm range. 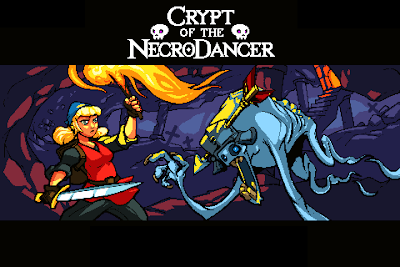 And remember, this is Crypt of the Necrodancer, so if you do choose to add your own music ensure that you keep the tempo dancefloor friendly for the optimum experience. 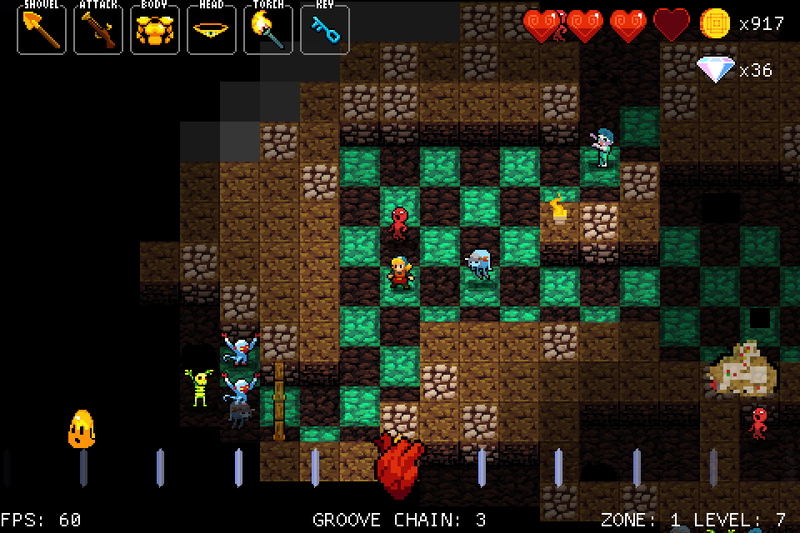 In conclusion, despite being unfinished, Crypt of the Necrodancer is already well worth the sub-$14 pricetag. Brace Yourself Games have crafted a sure-fire hit with widespread appeal, taking the best elements of two popular genres and creating a game experience that far surpassed our high expectations here at RGCD. Purchase the PC/Mac version for $13.49 here (from the official website).